A former Au-Cu-Pb-Zn-Ag-Sb-W mine located in secs. 31 & 32, T10N, R21E, MDM, 0.7 km (2,400 feet) SE of Colorado Hill (coordinates of record) and 0.6 km (2,100 feet) W of Loope, along Monitor Creek, on the lower slopes of the hill, on National Forest land (located claim). Discovered 1862. First operated 1864, through at least 1879. Two strikes were made (1867 & 1870), which stimulated production. Also operated during 1912; and intermittently during the period 1920-1968 (continuous production 1931-1941). MRDS database stated accuracy for this location is 100 meters. Owned by Siskon Corp., Reno, Nevada, and leased to Claude Lovestedt, Minden, Nebraska (1977). Operated by the Western States Minerals Corp., Colorado (1990). Owned by the Siskon Gold Corp. (Centurion Gold Ltd.) (100.00%), Canada (1990). Owned and operated by the Western States Minerals Corp., Colorado (1997). Owned and operated by the Atlas Corp. (50.00%) (1983), and by the California Silver Ltd. (50.00%), Canada (1983). 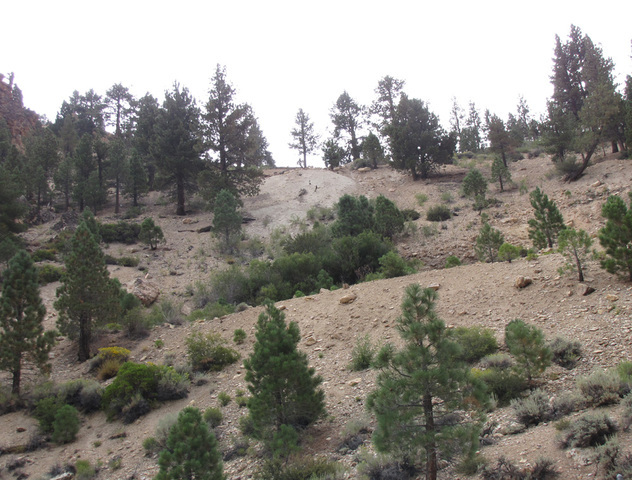 Mineralization is a hydrothermal vein deposit hosted in andesite, rhyolite, tuff, basalt, and sedimentary breccia. The ore body is 120 meters thick, 15 meters wide, and 125 meters long. Ore body No. 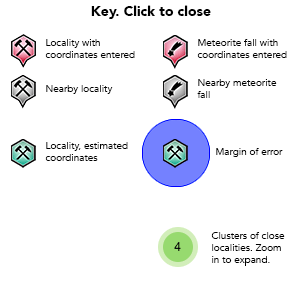 1 is a tabular-shaped mass in a fissure vein. The No. 2 ore body is stockwork. The primary mode of origin is hydrothermal. Primary ore control was fracturing and the secondary was faulting. Wall rock alteration is moderate (sericitic, silicification and intermediate argillic). The deposit is in silicified, altered rocks which are: 1.) dark gray, finely porphyritic, andesitic basalt; 2.) white and yellow to reddish-brown rhyolite locally showing abundant thin ribbons of gray quartz; and, 3.) some blocks of whitish-gray lapilli-tuff breccia, which apparently have been caught up in the rhyolite during its intrusion. The intrusive contact between 1 & 2 is exposed at the Colorado adit portal, & in parts of the Colorado, Advance and Upper Advance adits. Locally contacts sheared "ribs" of rhyolite & rhyolite breccia, to 50 feet thick outcrop on Monitor Pass Road. Underground, No. 2. is gray to white and contains disseminated sulfide minerals. Mineralized areas occur in soft clay pockets a few to to several feet in the longest dimension parallel to, and cross-cutting quartz banded zones and in soft, friable cores of anticlinal structures. Since 1960 these cores have produced the high-grade ore. Rhyolite cavities contain gray, euhedral quartz crystals up to ¾ inch long, on which crystals of rhodochrosite, pyrite, hübnerite and other Ag-bearing sulfites (?) (probably sulfides) may have developed. The ore occurred in bunches and was associated with pink and black manganese minerals. 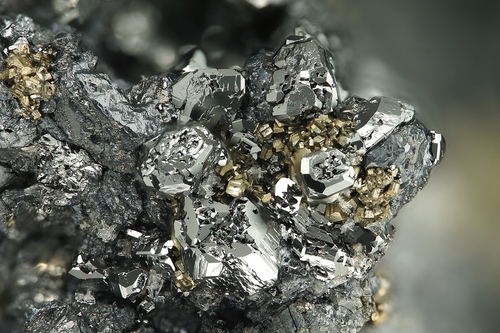 Benstron, cited in Clark, 1977, felt that hübnerite was an indicator of high-grade ore. The tetrahedrite is Ag-rich. Local rocks include Tertiary pyroclastic and volcanic mudflow deposits, unit 9 (Cascade Range). From Wachter (1971): There are several types of ore in the underground workings. 1. Ore in lower levels consisted of disseminated sulfides in banded rhyolite and rhyolite breccia (grains, tiny pockets, and veinlets of quartz, pyrite, sphalerite (and exsolved chalcopyrite), galena, tetrahedrite, and silver sulfosalts (mostly pyrargyrite)). Values in silver equivalent usually no more than 14 ounces per ton silver. 2. High-grade veinlets (1 to 1/4 inch) appear in the Colorado workings. These veinlets have the previously-mentioned minerals plus polybasite and coarse native gold. There is no evidence of supergene enrichment in either type of ore. 3. Sericite bodies (approaching 100% sericite) in new workings just under the hill face have, in their deeper portions, sulfides similar to the previously-mentioned ore type 1. 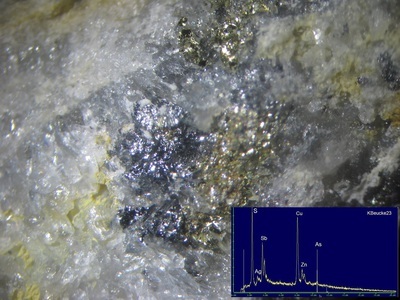 Here, the silver minerals are disseminated grains. Pockets of clay/sericite have grains of silver minerals and can be high-grade. Paragenesis of Zaca ore: 1. Quartz-rhodochrosite-pyrite. 2. Quartz-pyrite (+molybdenite?). 3. 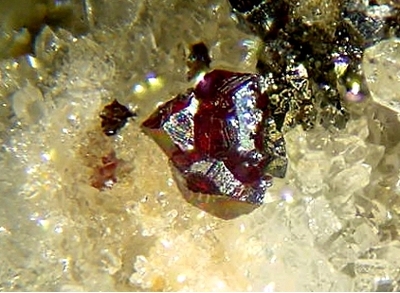 Quartz-sphalerite-galena (+huebnerite). 4. 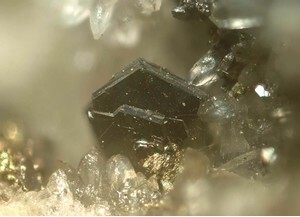 Tetrahedrite-polybasite-pyrargyrite. 5. 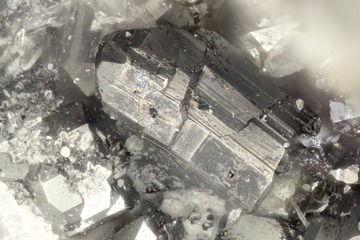 Proustite-acanthite-covellite (supergene). Alteration: In altered rhyolite, sericite and quartz are pervasive. K-feldspar (microscopic aggregates) also usually present. "Jasperoid" pinnacles above Zaca are rhyolite that has been altered to 65-95% quartz. Workings include surface and underground openings and operations with an overall length of 304.8 meters and an overall width of 182.88 meters, and an overall depth of 213.36 meters. Several adits were driven at thousands of feet long. Extensive crosscut drifts and winzes, plus stopes (see Evans, et al (19966)). One adit was driven 700 feet below the outcrop, 660 feet from the portal the adit is forked. There are also over 2,500 feet of drifts and crosscuts. A caved shaft was said to be 300 feet deep at the portal of the adit. Production data are found in: Clark (1977). Production information: Small shipments estimated with a value of over $50,000 (period values). A small shipment in 1920 reported yields of 100 ounces Ag and $20 Au/ton (period values). Peter Curtz operated the mine in 1879, employing metallurgist Ottokar Hoffman to apply the chlorination method to recover gold and silver. Ore was crushed and the sulfides were concentrated. Concentrates averaged $585/ton (period values), with approximately 38 to 43% of the value in Au and the remainder in Ag. Recovery was 91 to 95% (Clark 1977; Prenn and Merrick 1991). Several thousand dollars worth of ore was taken out in 1912 (period values). Claude Lovestedt operated the Zaca mine from 1961 to 1981. Approximately 20,000 tons of ore were mined and a flotation mill was used to concentrate the ore. Concentrates were shipped to smelters, including the Selby smelter. Typical ore grades (before concentration) were 5-7 ounces of Ag, 0.1 ounce of Au, and several pounds of Pb, Zn, and Cu per ton (Prenn and Merrick 1991). More complete accounts of production from 1920-1968 are found Clark (1977). Analytical data results: 1867: $150/ton Au, $800/ton Ag (period values). Reserve-Resource data are found in: Randol Mining Directory, 1996/97: 170. Reserves data: 1996: Demonstrated 8,532,979 metric tons ore at Au of 0.994000 grams/metric ton and Ag at 19.542000 grams/metric ton. Proposed future development of this site is based on drill-indicated reserves (in situ), containing an estimated 6,620,000 metric tons averaging 1.03 Grams/metric ton of Au and 24.0 grams/metric ton Ag. Recoverable indicated reserves using a 20% dilution factor are estimated to be 7,944,000 metric tons at a grade of 0.86 grams/metric ton Au and 20.0 grams/metric ton Ag. All infrastructure costs have been included with mine cap total. Mine cap is estimated to be 30%, and mill cap 70% of working capital. Reference: Eakle, Arthur Starr (1919), Alpine County: California Mining Bureau. Report 15: 9-13; Campbell, Ian & staff (1968), California Mining Review, 1967: California Division Mines & Geology Mineral Information Service: 21: 23; Evans, James R. (1977) Zaca Mine. In W.B. Clark, Mines and mineral resources of Alpine County. California Division Mines and Geology County report 8: 8; Pemberton, H. Earl (1983), Minerals of California; Van Nostrand Reinholt Press: 106. Reference: Root, E.W. (1868) On enargite from the Morning Star Mine, California. American Journal of Science, 2nd. Series: 46: 201-203; Clark, Wm. B. (1977), Mines and mineral resources of Alpine County, California: California Division Mines and Geology County Report 8; 48 pp. : 17, 19, 24; Pemberton, H. Earl (1983), Minerals of California; Van Nostrand Reinholt Press: 135. Reference: Campbell, Ian & staff (1968), California Mining Review, 1967: California Division Mines & Geology Mineral Information Service: 21: 23; Pemberton, H. Earl (1983), Minerals of California; Van Nostrand Reinholt Press: 132; Mineralogical Record (1989): 20: 129-142. Reference: Goodwin, Joseph Grant (1957) Lead and zinc in California. California Journal of Mines and Geology, Division of Mines: 53(3&4): No. 354: 413; Pemberton, H. Earl (1983), Minerals of California; Van Nostrand Reinholt Press: 101; Mineralogical Record (1989): 20: 129-142. Description: Encrusts ore minerals and quartz crystals. Reference: Gianella, Vincent Paul (1938), Epithermal hübnerite from the Monitor district, Alpine County, California: Economic Geology: 33: 341-347; Partridge, John F., Jr. (1941), Tungsten resources of California: California Journal of Mines and Geology, California Division of Mines (Report 37): 37(2): 264; Evans, James R. (1977) Zaca Mine. In W.B. Clark, Mines and mineral resources of Alpine County. California Division Mines and Geology County report 8: 24; Pemberton, H. Earl (1983), Minerals of California; Van Nostrand Reinholt Press: 331. Reference: Mineralogical Record (1991): 22: 37. Reference: Gianella, Vincent Paul (1938), Epithermal hübnerite from the Monitor district, Alpine County, California: Economic Geology: 33: 342; Evans, James R. (1977) Zaca Mine. In W.B. Clark, Mines and mineral resources of Alpine County. California Division Mines and Geology County report 8: 25; Pemberton, H. Earl (1983), Minerals of California; Van Nostrand Reinholt Press: 331, 344. Description: Occurs as pink crystals and as gangue.Occurs as crystals. Reference: Gianella, Vincent Paul (1938), Epithermal hübnerite from the Monitor district, Alpine County, California: Economic Geology: 33: 342-343; Pemberton, H. Earl (1983), Minerals of California; Van Nostrand Reinholt Press: 213.; Hanks, Henry Garber (1884), Fourth report of the State Mineralogist: California Mining Bureau. Report 4, 410 pp. : 159; Irelan, William, Jr. (1887), Sixth annual report of the State Mineralogist: California Mining Bureau Report 6, part 2, 222 pp. : 105; Eakle, Arthur Starr (1919), Alpine County: California Mining Bureau. Report 15: 5-27; […(abstract): Geol. Zentralbl., Band 27: 394 (1922)]: 25; Gianella, Vincent Paul (1938), Epithermal hübnerite from the Monitor district, Alpine County, California: Economic Geology: 33: 339-348. Reference: Clark, Wm. B. (1977), Mines and mineral resources of Alpine County, California: California Division Mines and Geology County Report 8; 48 pp. : 17, 19, 24; Pemberton, H. Earl (1983), Minerals of California; Van Nostrand Reinholt Press: 82. Reference: Eakle, Arthur Starr (1919), Alpine County: California Mining Bureau. Report 15: 9-13; Gianella, Vincent Paul (1938), Epithermal hübnerite from the Monitor district, Alpine County, California: Economic Geology: 33: 342; Partridge, John F., Jr. (1941), Tungsten resources of California: California Journal of Mines and Geology, California Division of Mines (Report 37): 37(2): 264; Campbell, Ian & staff (1968), California Mining Review, 1967: California Division Mines & Geology Mineral Information Service: 21: 23; Evans, James R. (1977) Zaca Mine. In W.B. Clark, Mines and mineral resources of Alpine County. California Division Mines and Geology County report 8: 24; Pemberton, H. Earl (1983), Minerals of California; Van Nostrand Reinholt Press: 140. Reference: Eakle, Arthur Starr (1919), Alpine County: California Mining Bureau. Report 15: 5-27; […(abstract): Geol. Zentralbl., Band 27: 394 (1922)]: 9-13; Evans, James R. (1977) Zaca Mine. In W.B. Clark, Mines and mineral resources of Alpine County. California Division Mines and Geology County report 8: 8, 24; Pemberton, H. Earl (1983), Minerals of California; Van Nostrand Reinholt Press: 108; Mineralogical Record (1989): 20: 129-142. Description: Tertiary pyroclastic and volcanic mudflow deposits. Comments: Original map source: Saucedo, G.J., Bedford, D.R., Raines, G.L., Miller, R.J., and Wentworth, C.M., 2000, GIS Data for the Geologic Map of California, California Department of Conservation, Division of Mines and Geology, CD-ROM 2000-07, scale 1:750,000. Root, E.W. (1868) On enargite from the Morning Star Mine, California. American Journal of Science, 2nd. Series: 46: 201-203. Hanks, Henry Garber (1884), Fourth report of the State Mineralogist: California Mining Bureau. Report 4, 410 pp. (includes catalog of minerals of California pp. 63-410), and miscellaneous observations on mineral products): 159. Irelan, William, Jr. (1887), Sixth annual report of the State Mineralogist: California Mining Bureau Report 6, part 2, 222 pp. : 105. Eakle, Arthur Starr (1919), Alpine County: California Mining Bureau. Report 15: 5-27; […(abstract): Geol. Zentralbl., Band 27: 394 (1922)]: 9-13, 25. Logan, Clarence August (1921), Auburn field division: Alpine County, California Mining Bureau, 17th Report of the State Mineralogist: 401. Logan, Clarence August (1922), California Mining Bureau. Report 18: 358. 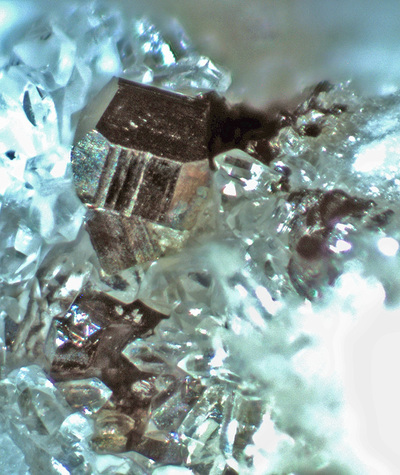 Gianella, Vincent Paul (1938), Epithermal hübnerite from the Monitor district, Alpine County, California: Economic Geology: 33: 339-348. Partridge, John F., Jr. (1941), Tungsten resources of California: California Journal of Mines and Geology, California Division of Mines (Report 37): 37(2): 264. Goodwin, Joseph Grant (1957) Lead and zinc in California. California Journal of Mines and Geology, Division of Mines: 53(3&4): No. 354: 413. Evans, J.R., ed. (1966), Guidebook Along the East-Central Front of the Sierra Nevada: Geological Society of Sacramento, Annual Field Trip, June, 1966. Murdoch, Joseph & Robert W. Webb (1966), Minerals of California, Centennial Volume (1866-1966): California Division Mines & Geology Bulletin 189: 320, 347, 385. Campbell, Ian & staff (1968), California Mining Review, 1967: California Division Mines & Geology Mineral Information Service: 21: 19-28. Wachter, B.G. (1971) Rapid fresh and altered rock-analysis for exploration reconnaissance: infrared absorption applications in the Monitor district, California. Ph.D. dissertation, Stanford University. Clark, Wm. B. (1977), Mines and mineral resources of Alpine County, California: California Division Mines and Geology County Report 8; 48 pp. : 17, 19, 22-27. Evans, James R. (1977) Zaca Mine. In W.B. Clark, Mines and mineral resources of Alpine County. California Division Mines and Geology County report 8: 8, 24-25. The Mining Record, California Silver 1981 Exploration Report (1981) (December 16, 1981). Mining Congress Journal (1982), Joint Development set for Zaca Property (June 1982): 12. Engineering and Mining Journal (1983) (January): 56. Mining Engineering (1983), Exploration (May 1983): 418. Pemberton, H. Earl (1983), Minerals of California; Van Nostrand Reinholt Press: 82, 101, 106, 108, 132, 135, 138, 140, 213, 331, 344. U. S. Bureau of Mines Contract No. SO221028, Report on the California Silver Ltd. - Zaca Mine, Markleeville, California, Final report (1983) (July). 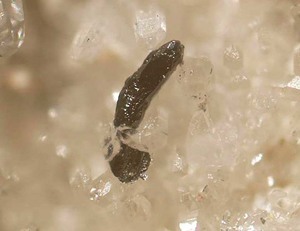 Mineralogical Record (1989): 20: 129-142. Prenn, N. and P. Merrick (1991), The Monitor-Mogul Mining District. Mineralogical Record. 22: 29-40. Randol Mining Directory (1996/97): 170. USGS (2005), Mineral Resources Data System (MRDS): U.S. Geological Survey, Reston, Virginia, loc. file ID #10034297, 10006821 & 10211705. U.S. Bureau of Mines, Minerals Availability System (MAS) file ID #0060030001. Morrison-Knutson Co., Inc. - Mining Group, Mine deposit file.